Walking in to the O Gallery in the Marathon Village in Nashville, I was shocked to find such a large amount of eclectic art displayed from floor to ceiling. I thought that there was no way it was all from one artist, but after meeting Olga Alexeeva, I quickly understood. She is unlike any artist I have ever met. She says that art is an expression of life and life is a kaleidoscope so art should be a kaleidoscope, too. Leaving her professional acting career in Moscow, Olga relocated to Nashville in 1991 to be with her sister, a Russian refugee. Olga says Nashville became a green, peaceful, picturesque haven for her, but during her first ten years here, she was basically just trying to survive. Her biggest struggle was the language barrier, but after learning English and getting settled, Olga found that her soul was hungry for something more. 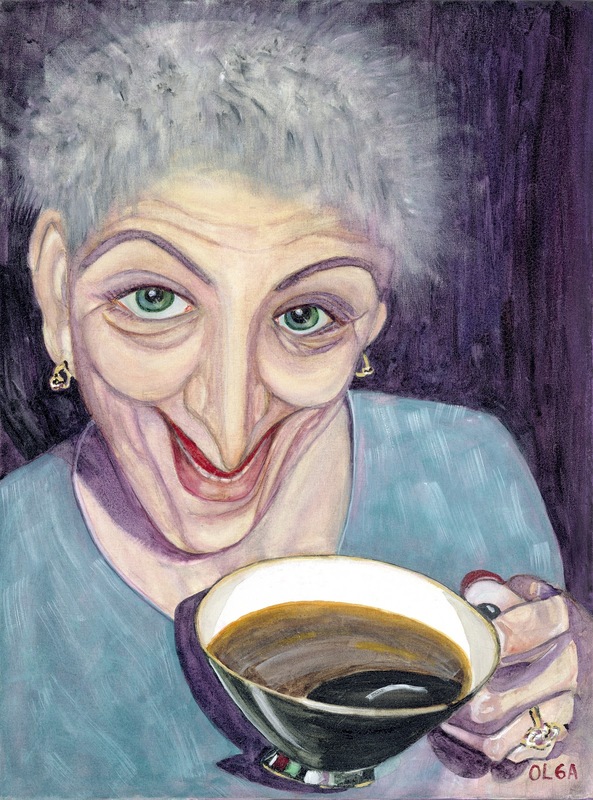 She tried many different outlets for her creative mind and painting was last on her list. She thought she was not good enough. Her attitude toward art was that she couldn’t paint because she couldn’t draw. 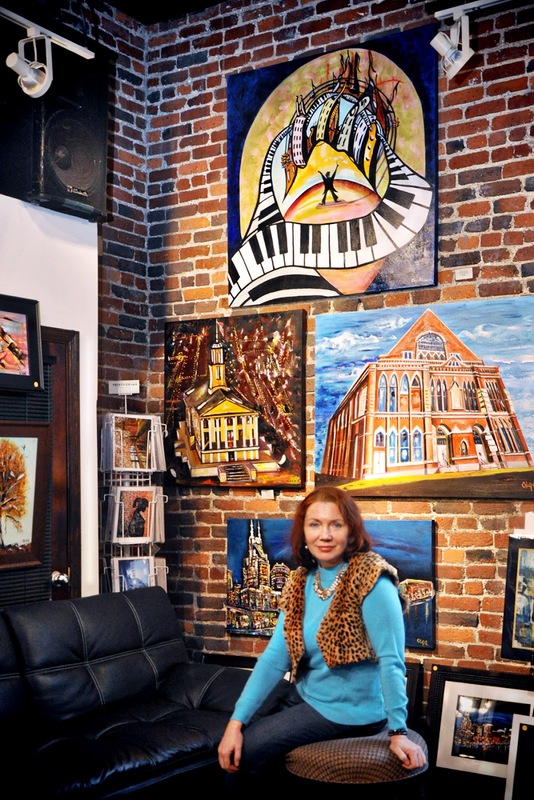 However, Olga’s mind was changed when Nashville artist and teacher, Hazel King, used her Southern hospitality to make Olga feel comfortable with taking a class. 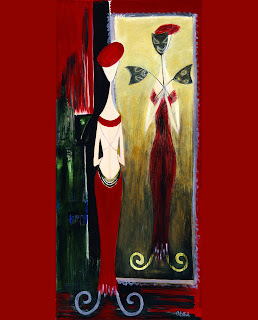 All experiences from theater, history and life in general poured from Olga to the paintings. Inspiration from different teachers had an imprint on her. She’s tried everything once. She said, “Curiosity is the most important ingredient for success.” She has an ongoing ability to look for something new, and says you should “never arrive.” A lot of people told her to pick one segment, technique or style and become good at it. She didn’t want to do that. She feels that everybody creates from the material within themselves. She has had eclectic life experiences with lots of layers and does not want to be limited. If she tries to make herself create through logic, it’s not coming from her soul. If something is not going in the right direction or it’s not natural, she stops. Olga still takes classes, even though she teaches them now. She does not teach a technique. She just instructs everyone to discover themselves by relating to her previous experience of not knowing she was an artist. She would have never painted, if she had another opportunity. She lives by her motto: “Be a child and try everything once to have a taste of it before you decide what you want to do.” She asks her students to be brave and allow themselves to be bad until they get better. She has been very humbled by the way her students have come back to her to say that their lives have been changed and their eyes have been opened to beauty. Olga is proud to have a role in that. The O Gallery received The Nashville Scene’s “Best of Nashville” Award for “Best Gallery” in 2012 and I think it was very deserved! The gallery is absolutely stunning. It’s one of my new favorites, and I plan to return soon for a girl’s night out painting party with a little wine and lots of creativity!